The Mid-1980's was indeed a Sitcom Economy in the Broadcast Television industry. 7 of the top 10 shows for the season fit this classification, and 11 of the Top 20 showings also belonged to 30-minute laughers. All networks experienced minor losses in overall averages between 4.3-7.0%, yet the sitcom averages maintained (ABC), experienced mild Gains (NBC, 5%) or soared to new heights (CBS, 20%). A fourth network, FOX, entered the arena in 1987 and was not counted in seasonal averages. Unlike the previous season, two outlying sitcoms in the Anemic classification survived. Only Mr. Belvedere would exit the season with a renewal, narrowly dodging cancellation for its remaining run. Like the previous season, 10 entries were cancelled, yet the season added additional renewals. This left a promising economy for sitcom, as 18 of these 21 renewals were greeted with a pass into the 1988-89 season. Following NBC's successful block trends for Thursdays and Saturdays, ABC and CBS decided to formulate their own evenings. 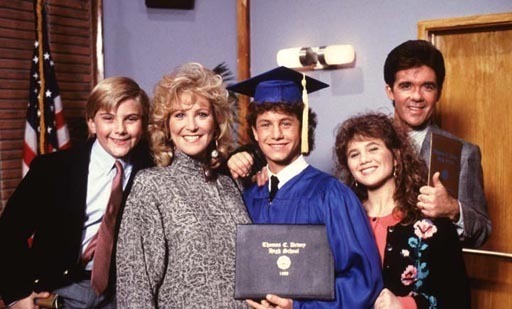 ABC decided to tackle the 8pm timeslots on Tuesday and Wednesday, with Tuesdays blazing bright with Who's the Boss and Growing Pains, and Wednesdays delivering middling performances with Head of the Class and Perfect Strangers producing successful results. However, an attempt at 2 hours of sitcoms on Fridays proved disastrous, as all but one show was cancelled. Even lone survivor Mr. Belvedere dodged the network blade as ABC decided to reverse its initial cancellation. A failed Saturday 8pm sitcom hour featuring marquee stars Lucille Ball and Ellen Burstyn crashed and burned against NBC's power night, and ABC used the remaining season to shop its weak sitcom crop around in these hours. CBS produced their own Monday comedy expansion with respectable results. All shows received renewal, though My Sister Sam (tragically featuring murdered starlet Rebecca Schaeffer and Pam Dawber) and The Cavanaughs would survive a mere 2 seasons. Designing Women made the third successful sitcom to join Kate and Allie and Newhart, with CBS shopping it mid-season on Sundays coupled with their only cancelled sitcom, Together We Stand (starring Dee Wallace and Elliot Gould). The show was retooled Nothing is Easy minus Gould in Spring 1987. The title must have referred to attracting viewers. And of course, NBC experienced prominence across the board. Thursdays and Saturdays received all of the attention, so NBC decided to color up its Mondays. Much like America's current president and Netflix's most-popular series, NBC thought orange was a suitable color for the evening. 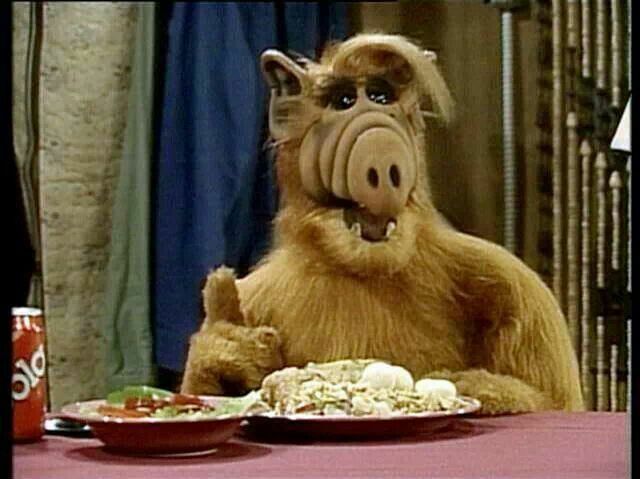 Enter ALF, an alien sitcom featuring the next icon of the 80's. It finished in the top 30 and anchored a comedy trend which carried NBC for the next 10 years on Mondays. 1986-87 proved to be a successful year for sitcoms, and the ratings showed. In an era which viewers were over glamorous soaps and Action-Adventures, family-friendly sitcoms were all the rage. Even cancelled family sitcoms received life beyond networks ending their run. Webster ended its ABC run this season, yet experienced a 2-year lucrative syndication run. It joined Charles in Charge, which ended unceremoniously 2 years earlier and enjoyed 4 years of syndicated exposure from 1987-90. Punky Brewster and Silver Spoons also made their syndicated debuts in 1987 after ending NBC runs the previous year. Spoons went into the garbage disposal, while Punky Brewster enjoyed 2 years off the network radar. These independent comedies were ahead of their time, as alternative platforms would eventually debut sitcoms on Netflix, Hulu and Amazon in the mid 2010's.